Indiana code requires that all licensed food service establishments have at minimum one person certified in food safety who is responsible for each physical business location. The Indiana State Department of Health (ISDH) Rule 410 IAC 7-22, Certification of Food Handler Requirements certification requirement took effect January 1, 2005. The ServSafe® Food Protection Manager Certification meets this requirement. The ServSafe® program is the restaurant and food service industry’s nationally recognized and accredited food safety training program. Some of the areas covered are contamination, food allergies, food borne illness, safe food handling, keeping food safe in storage, protecting food in preparation and serving, sanitary facilities and equipment, and sanitation guidelines. The textbooks are available in English or Spanish. The written exam can be taken in English, Spanish, Korean, Chinese, Japanese, French Canadian and large print English. Our onsite classes are offered in English. The fine print: Fees are non-transferable and non-refundable for cancellations or changes made less than 2 business days prior to class. You will be responsible for either picking up and signing for your certificate or paying an additional $15.00 for certified shipping and handling cost. Digital Exams: We now offer computer-based, exam proctoring at our Muncie offices and will make efforts to accommodate proctoring in other parts of the state when able. Pay for your exam now and bring your ID with you when you're ready for your exam. PAPER EXAM: We offer the ServSafe® Manager exam in paper format one time per week at our Muncie and Fort Wayne locations. Reservations must be made 10 days in advance to order your exam. Please call 765-702-5886 to make a reservation. The ServSafe® Manager exam is a challenging exam. We do not recommend sitting for the exam without taking a course or self-studying the material prior. We offer an online learning course to prepare for this exam or you may purchase the books through us by calling our offices at 765-702-5886. Take our Food Manager Prep Online Course to prepare for your ServSafe® exam from the comfort of your home or office. This convenient option allows you to study on your time. Once you purchase the course, you will be emailed a link to study at your pace. This course prepares you to take the ServSafe Manager exam. Our curriculum is designed and taught by a Certified ServSafe Instructor and Indiana licensed teacher. PINK LEAF GUARANTEE: If you don't pass your ServSafe Manager exam on your first try, we will offer one repeat class (online or live*) for free. *Live (in-person) classes are only availble in Muncie and are subject to scheduling. Group Classes: Pink Leaf offers group classes, 10 hours in length, by request across the state. This class is $89. The book and exam are sold separately. Corporate Classes and Custom Class Scheduling: We can offer our ServSafe® Courses at your location on your schedule. A minimum enrollment of 10 people is required for custom scheduling. *A youth with a current DCS or JD/JS case may qualify to take the ServSafe® Culinary Arts Camp Experience for free. Please contact us at 765-702-5886 for more information. ©2017 National Restaurant Association Educational Foundation (NRAEF). All rights reserved. 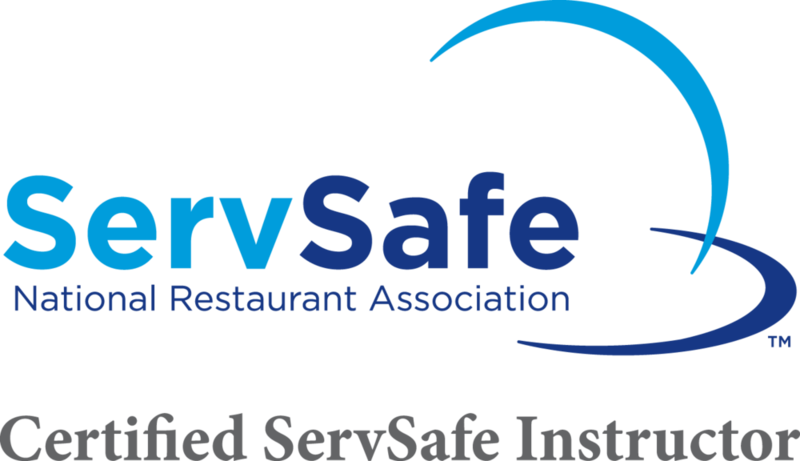 ServSafe is a trademark of the National Restaurant Association Educational Foundation. National Restaurant Association® and the arc design are trademarks of the National Restaurant Association.